Philadelphia – Little in strength, great in blessings! How would you evaluate success for a church, a church like ours? Are we successful? Is God pleased with Kitwe Church? How would you know if Christ is pleased with the way we worship, how we serve, or what we teach? In our secularized cultures, we often equate success with numbers – if our church is large and growing, and if we have influence in our city, then we are successful. Last year when I was preaching in Houston, I drove past the largest church in America. Lakewood Church is pastored by Joel Osteen and runs nearly 50,000 people each weekend, and an annual budget of $90m. If evaluation of success is size and influence, Lakewood wins! Last year in an interview with CBS News, Tracy Smith asked Osteen about hell, why he never preaches about it. Osteen responded, ”most people are beaten down enough by life. They already feel guilty enough.” Books: Your Best Life Now, Become A Better You, You Can You Will etc. We have been studying seven churches in the first century that reveal to us the various challenges and concerns that Christ has for His church. In Ephesus we learned that Christ is not pleased with sound doctrine if that doctrine is not accompanied by passionate zeal and love for Jesus – when love grows cold, beware! In Smyrna we learned that God is glorified and pleased when His people remain faithful in the midst of severe suffering and persecution – stay faithful. In Thyatira we learned that Christ is not pleased with loving service, genuine faith and even perseverance in trials if we do not also remain firmly grounded in His truth. In Sardis we learned that when a church becomes populated by unbelievers the church is dead regardless of its popularity or reputation. Philadelphia was the youngest of the seven churches. It was founded to be a center for Greek culture and language, a missionary outpost for spreading Greek culture in the region. This church lasted for centuries. 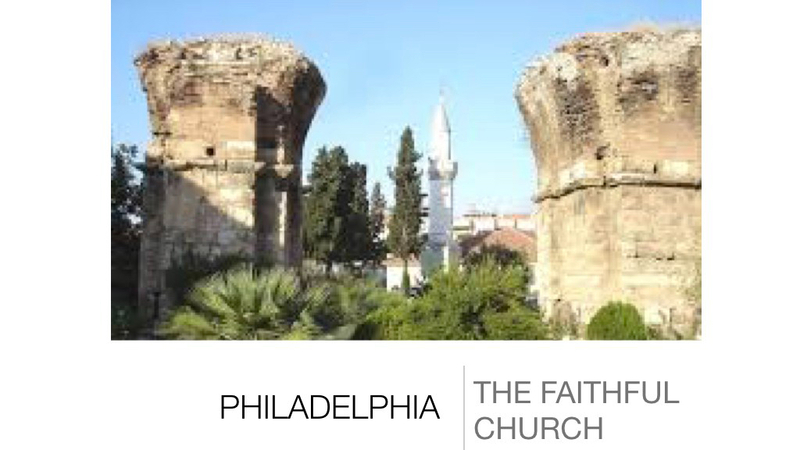 Christians in Philadelphia stood firm even after the region was overrun by the Muslims. It finally ceased in mid-fourteenth century. Philadelphia is a model of a loyal, faithful church. Jesus Christ is The Holy One. Holy means to be set apart as unique, there is no one like Him! He is completely set apart as God from sin. (Mk. 1:24, Jn. 6:69, Is 6:1-6; Rev. 4:8-11). No one else like Him exists! There is no other Savior, no other way, no other god! In His character He is completely without spot and flawless. There is absolutely no imperfection in Him. Jesus Christ is the genuine Messiah, the authentic one! He is the real Messiah! Any other who claims to be Messiah is a fraud. Any other message that promotes any other way to God is a fraud! Jesus Christ is the one and only real God! He is true! In 2013 when he first started claiming he was Jesus Christ, Bupete Chibwe Chishimba, a resident of Mindolo Township in the Zambian copper mining city of Kitwe was beaten up. When townsfolk spotted him claiming to be Christ and incarnated with the divine powers of Jesus, they assaulted him with objects and called for his crucifixion to prove his claims. Chishimba claimed he fell from heaven in 1999 with the sole purpose of initiating judgment for mankind and ending political rule. He claimed he could heal the sick and denounced church leaders for deceiving people by saying Jesus is coming when he was already here. These days the 43-year-old goes by the names of Parent Rock of the World, Mr Faithful and Mr Word of God. He drives a taxi inscribed with the words “Lord of Lords” and walks around the local marketplace spreading the message of the returned Christ. When Jesus opens, no one will close the door; and when He closes the door, no one will open it! You won’t climb into His kingdom by any other means, you must come through the door – and Jesus is the one who controls the door. Jn. 10:7 So Jesus again said to them, “Truly, truly, I say to you, I am the door of the sheep. 8 All who came before me are thieves and robbers, but the sheep did not listen to them. 9 I am the door. If anyone enters by me, he will be saved and will go in and out and find pasture. This church was a small church, they were few in number. It is unlikely that they had powerful, influential members. They were not well-connected, with no particular financial influence. In the eyes of the world they were weak. But God had opened a door for them that no one would shut! This may refer to the opportunity for ministry in their city, but certainly it speaks of an open door of access to Christ’s coming kingdom. In their weakness they simply took what they knew of God’s word and obeyed it! They did not deny Him. All disobedience is in some way a denial of God – His Authority; Power; Goodness; or Wisdom. These people faithfully engaged in ministry. They were not flashy, they were not trying to impress others, they may not have had the advantages of power, structure or connections, they simply obeyed Him! How do you respond when difficulty strikes your life? What is your response when you face the possibility of suffering loss for the sake of your obedience to Christ? These who have rejected and brought trouble to them for their obedient stand for Jesus and His truth, will come and bow down at their feet. Speaks of the millennial kingdom as we ‘rule and reign with Him 1000 years’. These people who opposed and persecuted them will come to salvation. These powerful, influential people will come to know Jesus as Messiah and trust in Him for salvation. No one is outside of God’s ability to save! No one! Don’t stop praying for the lost person who you are burdened for. Don’t stop sharing Christ with these people who mock and ridicule and make your life difficult. The Jews believed that when Messiah came He would love them and declare that love to all nations. Jesus promises that these same people will come to know the depth of Jesus the Messiah’s love for His church! I Jn. 2:2 He is the propitiation for our sins, and not for ours only but also for the sins of the whole world. Jesus loves you and if you love Him in return, it is because He took the initiative. This love is undeniable – the only way you can be reconciled to God is by receiving what God’s love has provided! He will preserve they, keep them in the specific trial that is coming. They kept doing right when it was not easy and when they were not sure of the outcome. They demonstrated genuine faith by glad abandoned obedience! Jesus is coming soon! God will rapture His church prior to the Tribulation period. The next event on God’s timetable – the snatching away of the church. (Rapture) This will be followed by 7 years of tribulation with the second half of this 7yrs. Known as the Great Tribulation. Then Jesus will return to earth with His saints, to do war with the Anti-Christ and at the armies of the earth. They will be destroyed in the Valley of Armageddon. Jesus will then set up a literal kingdom on earth for 1000 years. So keep on doing what you are doing! (11b) – you are not holding to human wisdom or power, you have something special, don’t loose it! This is a promise of a spiritual home – pillar in the temple. Often they would have the name of a person engraved on the pillar. This person was confirmed to have a right of entry into this temple. They were also promised spiritual stability, they would no longer will they go out and in. Earthquakes were common in this region, citizens would flee their homes and live in tents outside the city until the aftershocks were over. Jesus is promising his church a place of stability. They were promised spiritual inclusion into God’s program – “God’s name” would be written on them as a clear identification to whom they belonged. They were promised spiritual citizenship in God’s city. We are citizens of the kingdom of God! What a blessed assurance! They were not powerful, but they were faithful. They were not honored by others, but they were loved by God. They were not highly influential, but they were consistently obedient. Embrace the Gospel! Believe in Jesus Christ alone for your salvation!